It’s good to be home. I had the loveliest holiday break, but it’s good to be home. Even though I knew I was coming back to two weeks worth of mail to sift through, groceries to buy, meals to plan, piles of laundry to wash, it’s all good. As I’ve mentioned several times, I am not much on detox diets or cleanses after the holidays even though they are all the rage. I notice a lot of people overdo it even more between Thanksgiving and New Years knowing they will “cleanse” it all off starting January 1. Eh. If you just try eliminating sugar and flour for a few weeks, your health will improve drastically. You don’t need to give up real food and sip juice for a week. But that’s just my opinion. However I do want to share an amazing, healing and very digestible soup recipe called Bieler’s Broth. This soup is nothing new. In fact, it has been around for decades, invented by a doctor named Bieler. The soup is vegan and all vegetable-based. It is not a culinary soup in the sense that it is so delicious that you would want to serve it to your friends at your next dinner party, but more of a medicinal soup. It tastes absolutely fine though, just a little bland. 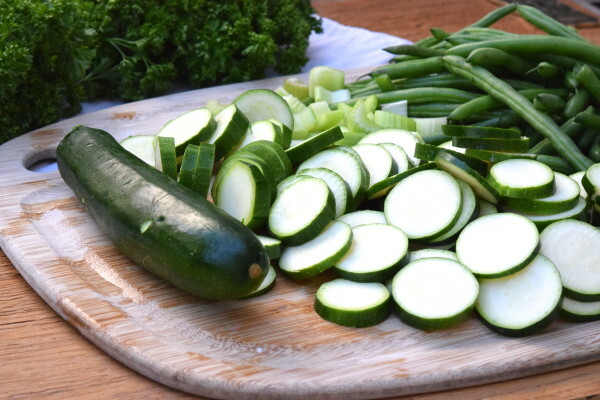 According to Sally Fallon in her book Nourishing Traditions, Dr. Bieler felt that this combination of vegetables was ideal for restoring acid-alkaline and sodium-potassium balance to organs and glands, especially the sodium-loving adrenal glands which suffer under stress. The broth is also supportive for liver function — recall that the liver is our detoxifying organ. Bieler’s broth is highly recommended for those under stress or suffering from stress-related conditions. Know anyone stressed out? Yep, I thought so. When I have had a lot of travel combined with a chaotic schedule and less than desirable eating, I’ll make a big batch of Bieler’s broth every few days and drink a mugful either as a snack during the day or with my breakfast or dinner. I don’t function well without protein and fats, so I can’t use this as a meal replacement. I always notice a big improvement in my overall wellbeing after supplementing daily for 2 weeks with Bieler’s broth. I made a batch yesterday which should last 3 days and I’ll make another batch on Thursday to get me through the weekend. I know that the vegetables in Bieler’s broth are not in season in the winter. I am normally opposed to that, but in this case it’s just temporary. Be sure to buy only organic vegetables since this is supposed to be a healing soup and pesticides will just add more toxins to the body. Also, zucchini is now a common GMO crop, so buying organic ensures you will be buying non-GMO. Here’s hoping 2016 is off to a healthy start for you. If you’ve gotten off on the wrong foot, it’s never to late to start fresh. Do check out the dinner planner I started posting on Sundays! It will change your life to plan out your meals. Promise! Place all ingredients in a pot and bring to a boil. Skim any foam on the surface, lower the heat and simmer, covered until the vegetables are tender, about 15 minutes. Puree soup in the pot with a handheld blender or in a blender in batches. I usually make this twice in a week and that will make enough for me to have a bowl every day. Hello. After many years of suffering and finally figuring out that I have Celiac’s disease, Bieler’s Broth was recommended to me and I would say saved my life. I still suffer from fatigue, low energy along with other issues. In the beginning I ate Bieler’s Broth for just about 90 days. I make a batch from time to time. I am wondering do you recommend eating nothing else at all but Bieler’s Broth? I don’t know if I am strong enough to go without protein? What kind of regimen would you suggest? I do feel so much better every time I make a batch. I want to make sure I am getting all the benefits from it and if I could benefit more, how? Thank you. HI Debby, I cannot recommend eating only Bieler’s Broth. I’m sure you could use it in a supervised fast, but you would need to have a practitioner make that decision after evaluating your condition. I love cilantro. Can I add 1/2 bunch to my soup? I don’t see why not. It’s a wonderful, cleansing herb! The last time I made this broth was in the late 70’s in Santa Barbara, where Dr. Bieler saw patients at that time. I never consulted him but a friend of mine did and she said that one of the ingredients was chard, since it is very alkaline. I can’t remember when he died, but in the end, this broth was the only thing he ate. I must have read his book! Hi Pamela, I’m surprised to find Bieler’s broth on the web anywhere. Dr. Bieler healed our father in the mid-1960s when my sister and I were ten and eleven years old. I’m soon to make some for myself, and I was really curious if I could find any mention of it on the Web. One thing I can tell you: Dr. Bieler had our father make the broth in a pressure cooker. We always pressure cooked it for ten minutes. 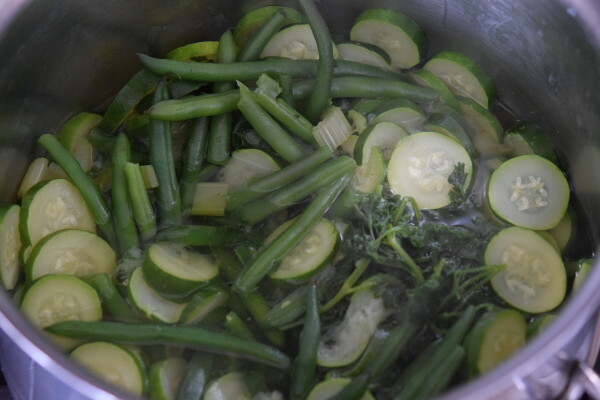 Bieler told us to do it this way in order to really break down the vegetables and make them absolutely mushy, that the nutrients be easily absorbed. Our father’s digestion was shot, after a several year stint in Washington D.C. for the company he worked for. Beiler said that the broth is rich in natural sodium and thereby would help heal Dad’s liver, and then digestion would gradually improve. And it did. After about three to four years of strict devotion to Dr. Bieler’s regimen, which included much more than the broth, our father was well again. Thank you so much for sharing your knowledge and the story of the positive impact this had on your father’s health! I have never seen this information about using a pressure cooker. So interesting! Pamela, I just discovered your lovely website while looking for more info on Dr. Bieler’s broth. I love the first hand story of your dad’s use of it, Greg, and Dr. Bieler’s suggestion to use a pressure cooker. Do you recall if it was ten minutes after reaching full pressure, vs a total of ten minutes? If you can share more about the protocols your dad followed under his care, it’d be fascinating. Susun Weed, as i recall, wrote that it’s best to cook leafy greens like kale for 45 minutes in order to break them down enough to absorb the nutrients. Any thoughts on that Pamela? Well, that would be especially helpful for anyone with weak digestion or thyroid issues. Thank you for this recipe, we’re working on a stomach re-set and I have high hopes for it. We enjoy your recipes and eat with you at least once a week. I ended up using 1&1/2 bunches of parsley so had 1/2 bunch left over. I used it to make a parsley lemon agua fresca. I’m wondering if you’ve tried this drink and would love to get your spin on one. It’s a common Mexican drink, “agua de perejil”. This is a very easy to digest and health supportive soup. I have made many agua frescas but never one with parsley! Sounds interesting. Is it sweet? Thanks for the recipe. We just made this and are enjoying it greatly. We weren’t sure though what to make of the term “stalk” for celery. It seems that one interpretation is the entire head vs. a single rib. We used two heads and it was fine but now wonder if we should have only used two ribs. Hi Lisa — a stalk is a rib. A “bunch” of celery would be the whole head. Would you also use frozen string beans? Lamont Langworthy, what was Bieler’s view on unprocessed wet sun dried grey celtic sea salt? Thank you for this post! Amazing! There are variations on different websites of this broth. Some have celery and some don’t. Why is that? Which recipe is the real one? How do we know? Thank you so much for all of your time and energy toward this. It’s interesting, because I thought this was the real one, and then a reader commented that Dr. Bieler was her personal doctor and he always suggested blending ghee with the soup to absorb nutrients. And I had never read that anywhere. 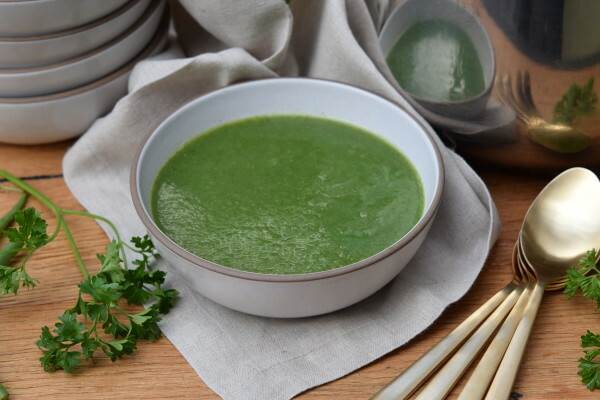 Celery is very alkalizing and I think gives nice flavor to the soup, so I wouldn’t hesitate to use it. 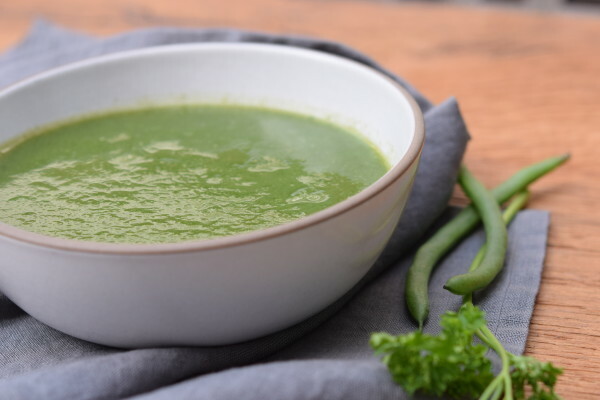 Dr Bieler also told us to add a tablespoon or two to the broth(I add it to the blender when I am blending it) because the fat helps our bodies better assimilate another key nutrient in the green beans. He was our family doc when I was a kid. Dr. Bieler was your family doctor??? That is amazing! Lucky you! What type of fat did you add to the broth?? I add Ghee.im sure coconut would be interesting. I bet the ghee would also add some flavor. I was always under the impression that no fat should be added to make the broth more digestible. How many days will this keep in the refrigerator? Do you use the water in the blender? You transfer everything in the pot, including the water, to the blender. My son has developed some gastrointestinal issues and we’ve been looking for ways to help ‘reset’ his gut. I’ll be making this soup tonight – so glad I remembered to search for it! It’s such a wonderful soup. Hope your son finds relief soon! Hi Pamela! First I have to say I adore your site and now make many of your recipes for my family…. so thank you! I would love to make this soup… wondering if it’s ok to freeze? I’m expecting baby #2 in two weeks and I’m planning on making a few things to have in our freezer ready to go. 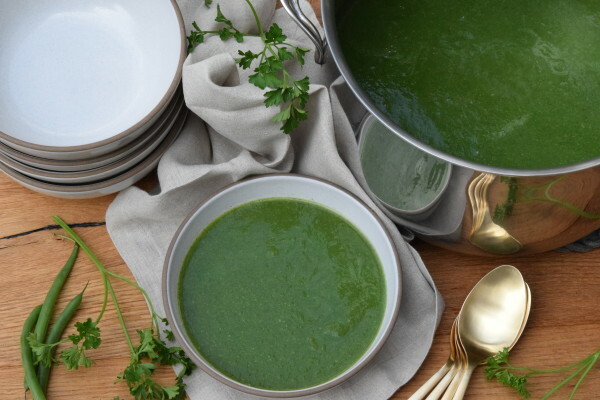 Would freezing this soup take away from the healing benefits? Congratulations and may you have an easy delivery! Yes, no problem to freeze this soup. Great idea! Wonderful!! Making this week. Thank you so much Pamela! Yes, we are so ready to meet our new addition! Hi Pamela, wondering if you can subsitiute organic bone broth in place of the water for protein? Would this in any way inhibit the purpose of the soup? I think that would work well as bone broth is healing and very digestible! one cup is a lot of butter, why butter how does it add health to this soup. No butter in this soup. I’m a little confused by your question…??? Hi , some of the Bieler Broth recipes on the internet say you can season / add salt. Can you please clarify if this is ok or does it cancel out the nutritional benefits? I would like to try making this today as a restorative broth as I am currently experiencing poor health. You can add a pinch of high quality sea salt. Except for a very few loopholes and possible cross-contamination, buying organic is supposed to imply a non-gmo food. I do agree that there is a lot of fear about GMO’s and there is so much controversial information out there. Everyone needs to educate themselves and make decisions that make sense to him or her. I have researched GMO’s for years and I am not one bit comfortable with consuming them or feeding them to my family or using them in my cooking classes. However, I do not promote an environment of fear around the subject on my blog, and in my classes I do say that I am not comfortable with them, but that everyone should make his or her own decision about them. I just made this today and it’s delicious! Didn’t change the recipe and it actually feels restorative as I drink it. Just what I needed. Thank you! Oh good! Happy to hear that. Be well. Hi! Happy New Year! I have everything but celery in the house. Do you think it would work to substitute carrots? I have everything but celery in the house. Do you think I could substitute carrots? Oh my gosh, I love this soup! I used to eat it years ago (pre-kids) and totally forgot about it. Thanks for the reminder and the recipe! Whoops I totally added garlic and aesofetida to my first batch! I don’t know what Dr Bieler would think of that, but I’m sure there were still many health benefits in the broth. Could I use frozen string beans for this recipe? It is very difficult for me to find fresh organic ones in the winter. Just what the body ordered! Looking forward to being “restored”. Thank you again for helping and inspiring us to take care of ourselves.